Megaflora includes identifiable macroscopic plant particles; the most commonly studied are leaves, fruits, seeds, and wood. To date, most work on the K-T boundary has focused on fossil leaf floras because leaves are the most commonly preserved macroscopic plant organs in this age rock (although European workers have focused more on fruits and seeds and Indian workers have concentrated on wood). Numerous aspects of fossil leaves must be considered when using them to study the K-T boundary. These include the origin of leaf litter and its relationship to its source vegetation; taphonomic and facies effects associated with transport, degradation, and burial; modes of leaf and cuticle preservation; sample size and sampling; stratigraphic and geographic spacing of sampled assemblages; taxonomic issues related to morphotaxa, leaf architecture, morphotyping, and the systematic utility of leaves; determination of paleoclimate from leaf physiognomy; and the utility of leaves for revealing plant-insect interactions. Leaves are shed from trees in vast numbers. A typical forest tree will generate tens to hundreds of thousands of leaves per year resulting in millions of leaves per hectare (several hundred leaves per square meter) of forest floor for typical forests (Burnham and Wing 1989). Surprisingly, broadleaf evergreen forests tend to generate more leaf litter than deciduous forests, a fact attributable to the longer growing season and continuous leaf drop. Some herbaceous plants retain most of their leaves rather than dropping them, but all forests produce abundant litter. Forests growing on floodplains and other depositional environments produce litter that has high potential for burial either in situ from overbank flooding or by being entrained in channels. Leaves and leaf litter degrade rapidly, and unless buried, will be fragmented or decayed to humus and recycled within months. Since sediment deposition in terrestrial ecosystems is typically episodic, the formation of leaf beds is more a function of rapid anoxic burial than the availability of leaves. Shallowly buried leaf beds are often destroyed by subsequent pedogenesis. For these reasons, leaf beds represent the least time-averaged of almost any type of fossil deposition, typically less than one year (Johnson 1993). Due to their abundance at the source, leaves generate rich fossil deposits and are suitable for the collection of large sample sizes. Leaves do not fall far from their source tree and a majority of each year's litter is initially deposited within a distance from the trunk equal to its height. Comparison of the relative number of leaves from a single species in a forest and the basal area of trees of that same species has shown a positive correlation, so it is possible to recover the composition and relative abundance of forest trees from the leaf litter (Burnham and Wing 1989). Herbaceous plants are preserved only in exceptional cases such as volcanic ash falls or slurries (e.g., Wing et al. 1993). In many of these cases, whole plants are preserved. Secondary transportation by wind or water can move leaves great distances and leaves falling into large rivers may travel hundreds of kilometers before downstream deposition. If a leaf assemblage can be shown to be in situ with careful taphonomic analysis, then the resulting flora, if properly sampled, can reflect the relative abundance of the source forest. Conversely, transported floras represent a broader but less precise sample of local vegetation. 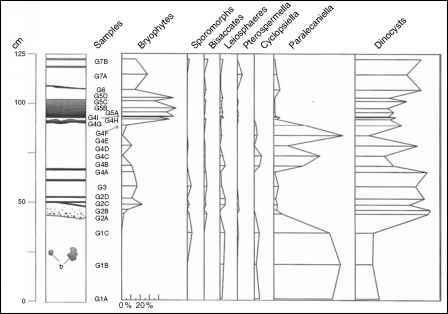 Sedimentological analysis of fossil-bearing strata can identify original deposi-tional settings and, used in concert with censuses of plant macrofossils, can provide the basis for mapping coeval vegetation types across ancient landscape surfaces (Hickey 1980). Because sedimentological facies evolve and migrate with basin evolution, it is critical to be aware of floral changes that are due solely to facies change. Quality and type of preservation vary greatly from basin to basin and are linked closely to sediment grain size, diagenetic history, and basin chemistry. Some continental basins have been so oxidized that fossil leaves are effectively absent or, if present, are represented solely by faint impressions rather than compressions. Organic-rich sediments by definition preserve abundant plant fragments but the quality of preservation is linked to taphonomic history and degree of lithification. In the best cases, whole leaves are preserved with their waxy cuticle intact. In these cases, the fossil leaf provides dual information in the form of cuticular microstructure and leaf venation. In extremely rare cases, leaves are still attached to petioles and branches and these may be attached to fruits, flowers, cones, or seeds, providing an additional level of botanical information. In most cases, leaf venation is preserved in the absence of cuticle. A certain level of venation preservation quality is necessary for a fossil leaf to be identifiable. Angiosperm leaves have as many as seven orders of venation and at least four are desirable for reliable identification. The identification of plant macrofossils is often an organ-specific exercise because plant parts are most often fossilized as detached organs. For this reason, leaves, fruits, seeds, and wood are often referred to morphotaxa, which are recognized in the International Code of Botanical Nomenclature (Greuter et al. 2000). To date, most Upper Cretaceous and Paleogene megafloral paleobotany has focused on fossil leaves and the utility of this system is increasing with developments in leaf architecture, which allow delineation of leaf taxa into morphotypes analogous to botanical species. Leaves offer benefits in the form of climate proxy data from leaf physiognomy, which allow estimation of both mean annual temperature and precipitation (Wolfe 1993, Wilf 1997, Wilf et al. 1998), and plant-insect interaction data from insect-mediated leaf damage (Labandeira et al. 2002). Based on censuses of leaf litter from extant forests, it is clear that more than 300 leaf fossils from a single quarry are desirable. This number allows for a reliable rarefied richness of the floras to be calculated using a rarefaction analysis of the relative abundance of taxa in the flora. Making a collection of this size usually represents a significant excavation and the removal of up to a cubic meter of rock. This is usually accomplished by the bench quarry technique where a leaf-bearing horizon is discovered and overburden is removed creating a benched surface on top of the productive horizon. A suite of prepared and censused fossils from a single bench quarry represents a sample that is tightly constrained in time and space, as it represents a group of fossils from a single deposit in a specific depositional environment. These collections, at their highest levels of precision, may sample as little as a few centimeters of strata and essentially represent less than a year's accumulation. These are arguably the most temporally precise of all fossil assemblages, greater perhaps even than pollen and spores, because leaves, as large and complex compressions, are not subject to stratigraphic reworking. Because plant parts can be transported various distances, multiple samples from different facies at the same stratigraphic level can provide resolution of the original spatial heterogeneity of the source vegetation. In rare cases, leaf litter is even preserved in association with in situ trunks or stems and relatively specific vegetation patterns can be mapped (Ellis et al. 2003).